The Helping Families Programme is an innovative parenting intervention developed for multi-stressed families living in complex social circumstances with primary-school-aged children who experience severe and persistent conduct problems. The Programme has been developed, implemented and evaluated through a research collaboration led by the National Academy for Parenting Research (NAPR), UK, and involving the University of Queensland and Griffith University, Australia. Preliminary evaluation has demonstrated very positive results. In the beginning I thought he was the devil child, turned into a demon. I couldn't stand him. If social services came to take him I'd go 'yeah, take him...' I couldn't be bothered with L. Now we have a better love and we are more connected". 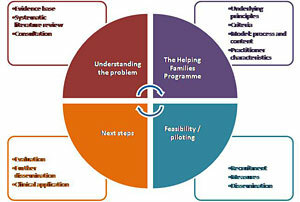 NEWS FLASH C4EO validates HELPING FAMILIES PROGRAMME!